China, not the US, will be at the center of a new Asian trade pact. TPP would open the door to China to promote its own trade agreements - Reporting Yawen Chen, Nicholas Heath, and Michael Martina. China said it will actively participate in bilateral and multilateral trade deals, with the goal of deepening reform and opening up its economy, regardless of the direction the Trans Pacific Partnership (TPP) or the China-backed Regional Comprehensive Economic Partnership (RCEP) might take. The statement follows U.S. President-elect Donald Trump saying he would withdraw the United States from the multi-country TPP that excludes China, putting RCEP – a rival pact that excludes the United States – as the front-runner for new free trade deals in the region. When asked for clarification on the specifics of the planned reform, Commerce Ministry spokesman Shen Danyang said in a briefing on Thursday that it was “comprehensive” and included economic reform. China will push for RCEP negotiations to be sped up to conclude soon, with full respect for Association of Southeast Asian Nations (ASEAN)’s core status in the deal, Shen said. Chinese President Xi Jinping pledged at the APEC summit in Peru to open the economy further, as leaders of Asia-Pacific countries sought new free-trade options following the election of Trump whose campaign promised to scrap or renegotiate trade deals. The RCEP, which includes Australia, India and more than a dozen other countries, is seen as perhaps the only path to the broader Free Trade Area of the Asia-Pacific (FTAAP) to which APEC aspires. The China Daily, the official state-run English-language newspaper, said many Chinese commentators were revelling in the demise of the TPP, and called it an “excessively complex” deal that was “doomed from the start”. “Encumbering a trade arrangement with too many politics isn’t the right way to do business,” the paper said in an editorial, adding that the TPP was “more of a political weapon than a real business deal”. “So long as it is meant to be genuine real trade, China is happy to write the rules with all its partners,” it said. China says it will promote trade deals regardless of TPP, RCEP direction. 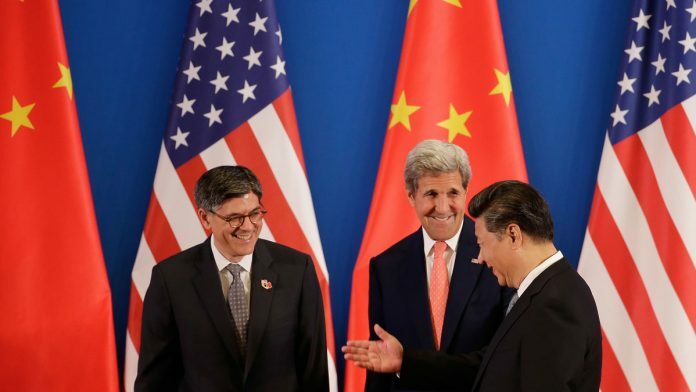 TPP would open the door to China to promote its own trade agreements.